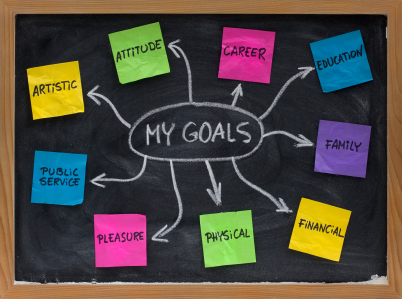 Goal setting seems to be one of the Things That We Do in our society. Reaching for goals can be a good thing. It’s good to have something worthwhile to work for. Your first step when setting a goal is to choose something that matters. Think about what would really make a difference in your life — and perhaps in the lives of others. You will be more likely to stay on track with your goals if you take the time to choose something that matters to you in the long run. Think about what could appreciably improve your life, and then make that one of your goals. Before you get started on your goal, you need to take some time to look inside. A little introspection is good. Be realistic not just about what you can accomplish, but what you might have to give up in order to reach your goal. Few truly worthwhile things are easy, and most require some sort of sacrifice or trade off. You need to acknowledge that, and recognize what you could be missing out on. My efforts to get healthy have meant that I have needed to cut back on sweets (which I love) and make time for exercise (which I’m not fond of). However, the end result of better health matters to me, so I’ve been willing to make the sacrifice. The hard work is starting to pay off a little bit, too. Too often, we get caught up in making lists. You might list out several things that you wish would happen in your life. Unfortunately, putting together a list like that can lead to failure. This is particularly true if you have a lot of big goals that matter. Productivity experts are moving away from the idea of multi-tasking, and you should move away from the idea of trying to do too much at once. Pick something that matters the most to you to work on, and then make that your focus for now. Next, break your big goal down into milestones. Think about what it will take to achieve your end result. Plan out the necessary stepping stones to your goal. Mark milestones so that you have an idea of how much progress you are making. Chunking your large goal into smaller milestone goals can help you manage your expectations, as well as manage your success. Make sure that you follow a logical course, and then focus on one step (or mini-goal) at a time. Don’t just define a concrete goal with your milestones. Take the time to picture the end result in a way that resonates with you. Think about what you will do, or how you will celebrate, when you achieve your goal. If you want to free up more time for volunteer work, picture yourself serving at the food kitchen, or picture the end results of a charity auction that you helped plan. Think about what success will look like, and you will have more motivation to stick with your goals, and make them happen. Go back and remind yourself why you set the goal, and remember why it matters to you. Finally, use positive language. Instead of say that you’re going to stop eating as many refined carbs, phrase it more positively. Say that you are going to eat more whole grains. Look for ways to be positive in your statements. This works for more than just writing our your goals. You also need to think in terms of what you are gaining, rather than what you are losing. If you just dwell on what you’re giving up, no matter how much you think the trade off is worth at the outset, you will eventually be worn down by negativity. Look forward and note progress, and be positive about your efforts. What do you think? What helps you set better goals? Great post Miranda. Thank you for sharing your thoughts with us. What i already use in my goal setting process and really help me allot is “Break It Down”. Braking my goals (even the small ones) to smaller mini-goals. This way i can accomplish smaller things, feel satisfaction and finally achieve the bigger goal easily and without frustration. We do the same thing. We were just making our 2013 goal list and with each goal we wrote down the steps and mini milestones it involved. It is much easier to manage that way. I really think it does help to break it down. It’s so easy to get overwhelmed when you have a huge goal. Good tips all around, and I especially like the last 2. Picturing the end result, and visualizing what it will be like to succeed, can really help. Also, the way we word goals and approach them can impact our chances of success, which is why using positive language can help. I totally agree. We aren’t too motivated by negative language. If anything it makes us want to do the thing less. By staying positive we can encourage ourselves to keep plugging along. A lot of people underrate the usefulness of positivity and visualization. While fear can be a great short-term motivator, if you really want to accomplish something worthwhile long-term, positivity is a must.